Pocketful of Treasures: Post 2: Don't just survive the newborn days, THRIVE! Post 2: Don't just survive the newborn days, THRIVE! Not only did you survive your pregnancy, but you thrived! CONGRATULATIONS!!! Bringing home a newborn baby is oh so precious! But it can also be a wee bit stressful. We now have 5 children (with number 6 on the way), but I still remember the anxiety and fear over bringing home our first child and caring for her. I could not believe that such a tiny, fragile, precious piece of life was entrusted to ME! I pretty much had no clue what I was doing, but was determined to do everything right. She even received her first bath in a heated tub of water that we placed in front of the fireplace so she would not get chilled. I spent much of that first year anxious and stressed out, and she did too! She would cry and cry and cry and never seemed to sleep. We NEVER left he house. It's funny to me now that I could not go food shopping with just her but now I'm that crazy housewife that drags all of my kids and 3 shopping carts in a trail behind me through Kroger. I've learned a lot these past 8 years! One revolutionary discovery I made almost four years ago was Young Living products - what a blessing! I'd love to take a few minutes to share a few of the products that made the biggest difference in our family life, especially for our little ones. Essential oils are plant based, created by God, and designed to support our bodies! But, they are very powerful and it is good to be cautious, especially if you are new to oils or you are using them children. 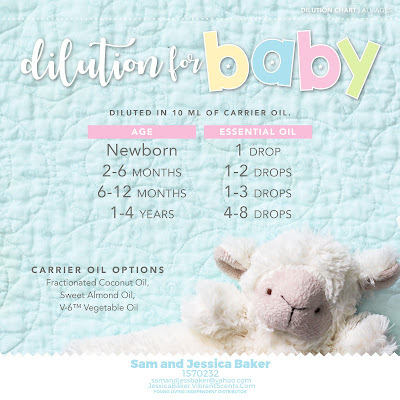 A newborn’s skin is very thin and delicate, so the essential oils will be absorbed much more rapidly than on an adult. Start slow and dilute appropriately! The best place to apply a new oil topically is to the feet. Use one oil at a time. Introduce a new oil as you feel comfortable. God has given us mothers an intuition for what is best for our babies. If you feel comfortable with introducing a new oil every few days or every 6 hours, do what feels right for you. I personally chose to anoint our child with Frankincense when he was less than an hour old. However, frankincense and diluted Myrrh were the only oils I used on him for the first several weeks because that is what I felt best. By the time he was 6 weeks old I felt comfortable using most of the oils. If you are still a bit hesitant, use the KidScents oils! They are prediluted and gentle for babies and kids. Those first few weeks it may seem as if you are never going to sleep again, but I promise you, this season will pass! And there are lots of things you can do to help you and baby sleep. SleepyIze essential oil blend can be diffused at bedtime to promote relaxation and restful sleep. It contains Lavender and Valerian essential oils, known to help promote a peaceful environment, plus many others. Or you may choose to create a rollerball to easily apply to baby’s feet during your bedtime routine. I have also found it helpful to use Lavender or SleepyIze with a nightly baby massage. I find massaging with oils to be relaxing in itself, and a bonding moment between mom and baby. Peace and Calming and Stress Away are well loved in this household! Oh how I wish I had these oils when our daughter was a baby. She would cry and cry and cry. I remember one of us always having to hold and walk with her just so the other person could eat. Stress Away is a personal favorite of mine! It is the first product to contain the unique stress-relieving combination of lime and vanilla pure, therapeutic-grade essential oils. Stress Away also includes copaiba and lavender to reduce mental rigidity and restore equilibrium. Featuring powerful plant constituents, such as the cedrol found in cedarwood and the eugenol that occurs naturally in vanilla, Stress Away can help induce relaxation and reduce occasional nervous tension. All of these ingredients are expertly blended with the exotic scent of ocotea, Young Living’s exclusive Ecuador single. One of the most common reasons for an unhappy baby is an unhappy tummy. Remember that Ginger you used to help you survive morning sickness? You can now use it on your baby! TummyGize Essential Oil for Children supports healthy digestion and quiets little tummies. 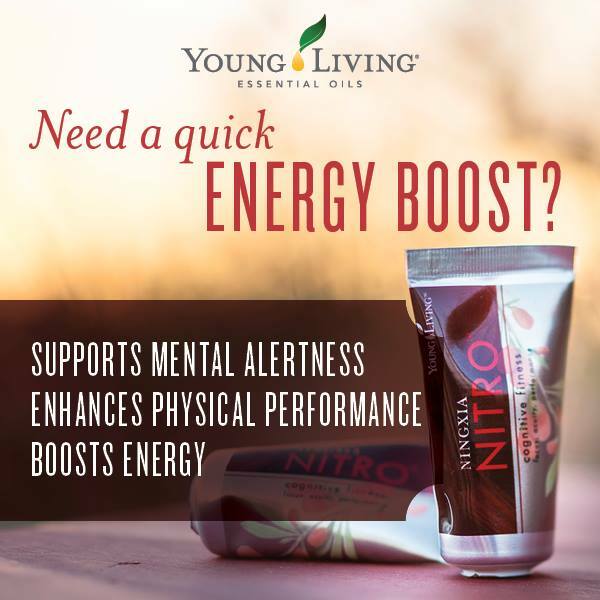 Soothing and supporting specifically formulated for kids! TummyGize contains 8 essential oils – including Spearmint (rich in carvone and d-limonene, may help occasional nausea), Peppermint (one of the most highly regarded herbs for supporting normal digestion), Tangerine (contains esters and aldehydes that are calming), Ginger (to soothe, comfort, and balance digestive discomfort), Fennel, Cardamom, and Anise (all supportive of a healthy digestive system). We have diffusers in just about every room of the house! Have you seen the KidScents diffusers? Our girls LOVE their Dolphin Diffuser, and the boys are getting the Dino Land Diffuser for their birthday! But regardless of what diffuser you have or what it looks like, you will love the benefits and support it provides your little ones. SniffleEase essential oil blend contains oils such as Eucalyptus Blue, Peppermint, Lavender, Ravintsara, Palo Santo, and other respiratory and immune supporting oils. This oil blend is refreshing, and as part of the KidScents line, is formulated just for kids. Myrtle has an uplifting aroma that is pleasing when diffused. It also supports healthy respiratory function. Lavender and Melrose are so supportive of the skin. I use these two oils in many applications for baby. You can make your own baby wipes by cutting a roll of Brawny paper towels in half. Combine 1 ½ cups water with 1 TBSP Young Living bath gel base, and 10 drops of Lavender or Melrose (or combination) and store in a round Rubbermaid container with ½ roll. You can also mix Lavender and Melrose with Coconut oil or Animal Scents Ointment and apply to a sore bum. Speaking of sore bums, enjoy some of these Sore Bum tips from Melissa Poepping’s “The Chemical Free Home 3” (see book for a complete list). *“Change it: Change the diaper immediately after baby goes. *Wipe it: With wipes that you that you make that are free of chemical irritants that worsen a sore bum. We gave up on one of those special diaper pails many years ago. The bags for it was just one more expense, we clothe diapered part of the time, and I just didn’t find it all that convenient. If they work for you, great! Instead, we found Walmart sacks work great and we occasionally diffuser Purification to help with any unpleasant odor. And you all know my love of Thieves Household Cleaner. Did you see the before and after pictures of our couch on Toxin Free Family?!? If it could save that old dirty couch, it can handle any messy situation! Plus, I love that I can spray Thieves on the children’s toys and not have to worry about them putting those toys in their mouth. And as the kids get older, it nice to allow them to clean without worry of exposing them to toxins. By now, if you are not yet a Young Living member I’m sure you are a tad overwhelmed and wondering where to begin. With a Young Living Premium Starter Kit! 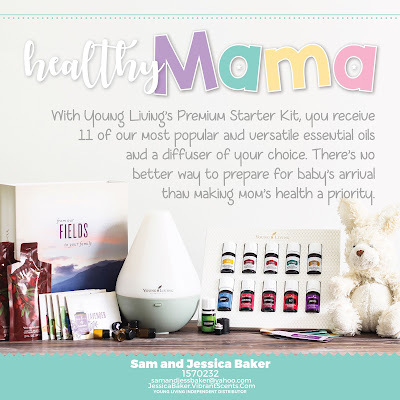 I’m a frugal momma, and it’s the only thing on the Young Living site that’s half off. I recommend one of the Diffuser Premium Starter Kits. If you take the diffuser off, you’re literally getting 11 bottles of therapeutic grade oil for $70! The kit also comes with bottles to share the oils with your family and friends, an AromaGlide roll-on bottle to apply the oils on the go, and samples of NingXia Red for full system support. You also get a diffuser with the kit AND a lifetime wholesale membership. That means 24 percent off your oils and products FOR LIFE. Every single order you place is 24 percent off. What a way to invest in the future health of your child! Go to youngliving.com, click on “Become a Member”, and fill out the form. You’ll need a sponsor and enroller number because Young Living is a multi-level marketing company. Many people tell me they can’t buy from an MLM, but when you shop at Walmart, you’re supporting a CEO’s third home. 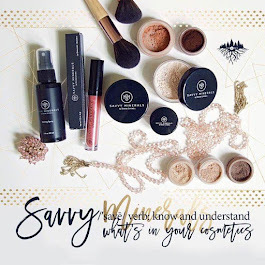 When you shop at a MLM, you’re buying local. You’re supporting my family business. You’re paying for gas in our car and food on our table. It’s the best business out there, and one of the most important reasons is you get to see your friends and family financially blessed. My member ID is 1570232. If you are pregnant or nursing, please consult Gentle Babies by Debra Rayburn or The Reference Guide for Essential Oils by Higley for safety information. What I am sharing with you today are all things that I personally did during pregnancy, labor & delivery, and what I call the 4th trimester (those early newborn days). I do not claim to be an expert on these topics, just an experienced mom that is pleased with her oily pregnancy. You must weigh all the advice given to you and take only what you and your health care provider deem appropriate. Would it be ok if I shared another secret with you? 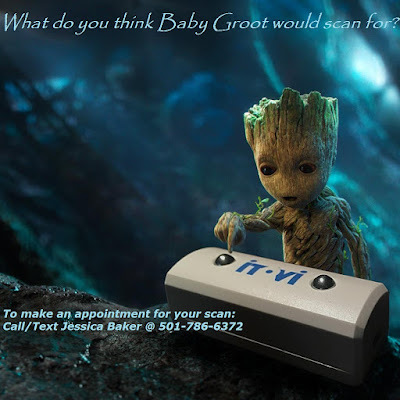 When baby is fussy or unhappy and I just don't know what to do, I scan him/her with my personal iTOVi! This little device is AMAZING! In less than a minute I gain so much insight into what my little ones need to stay happy, calm, and healthy. Get yours today at itovi.com.